Four win in a row and Newcastle have also been playing really well so before the Leicester City game who would ever have predicted we could beat Leicester at home, win on the road at Tottenham and Manchester City – and then finish that off with a win at home to Liverpool? Nobody, and that’s one reason Alan Pardew has called the run unbelievable. And now we have to keep up the good form and the win streak by going all out at West Brom on Sunday. And after that game there is a two week International break, so even more reason why we need to get another good result over the weekend. A fifth win in a row will see Newcastle completely buzzing over the next couple of weeks. Previous Post Is This Part Of Newcastle Finally Starting To Work? think the difference has been over the last 3 games (not even the 4 games we won tbh) the players have been looking forward first instead of back first ! noticed it in the liverpool game tbh when puds kept passing back and making sure they was in defensive positions before they attacked which is how we have mostly been playing ! it invites pressure imo but attacking pushes other teams back hence the defence has more time to deal with half the pressure. pards deserved the critisism but over the last 3 games he deserves the credit also. carry on playing forward pards its a step in the right direction. oh and abied (who i’ve allways called rubbish) has now proved me wrong and has turned into one of my fave players over the last few games so well done to the lad for proving me wrong. We have done well and won some unexpected points but the next 4 games against rival clubs is vital for us to pick up as many points as possible. I feel Tiote as well as Mbiwa will be sold for circa 20 million. Hopefully this will be reinvested wisely in the team. in midfield sissoko/colback/tiote/abied pick any 3 of the 4 and i think we have a top 6 midfield imo and are very very hard to get through. i’d agree with poster on last thread that anita should go now (not that he’s a bad player as i think he’s quality tbh but i think he’s stopping the likes of bigi getting the slightest chance and the fact we have siem also means he’s slipped further. river and goofy are my only concerns atm as goofy is being turned into a guti (or is a guti allready) and river looks like he will go the same way unless he’s played as an off striker. We’ve done well over the last few games , but to call it unbelievable is testament to how bad we have become under pardew . Yeah we’ve picked points that we never thought we would have but . Let’s be honest , we aren’t a pub side or some non league team who could call it unbelievable , we are a perm side who really should be in the same league as other sides in the prem , so unbelievable belittles the name of NUFC really . Bit looking at the crap we’ve had to put up with these last 4 years , it could be a turning point . Was a big fan of gouffran but his form this year has been bad. Im glad pardews eventually dropped him, hopefully it will give him a good kick up the @rse. Always—– probably yeah . He’s got a good shout . There is no doubt that Pardew deserves credit for lifting the players after the Soton and Stoke no shows, but for people to expect apologies and to forget the horrendous football and arrogance, not to mention his disciplinary record over the last two years is asking too much. I expect him to win two lots of four in a row and six streak. I want to see back to back 4-0 wins over the mackems. I expect at least two four nil wins away from home and want to see us beat Lpool 7-0 at Anfield, I might just forgive the slimy wearer of silly glasses if he achieves this. Don’t forget the away win at the Etihad. I think Koeman is more likely to scoop that award, I think he’s won every game. Also the Liverpool game was in a different month, but still, he has a good shout. He may also get bonus points for this “turnaround” he’s produced. Nothing like a few generous comments from you to start the day. Apart from maybe the 8-0 against Sunderland…. We all want/need that in our lives! A bit early to predict I know but come seasons end I would sell Gouffran and Anita. With Abeid hitting his stride Anita is now 5th choice in central midfield behind Tiote, Colback, Abeid and Sissoko. And with Sammi, Aarons and Perez coming through there is no room for Gouffran up forawrd and lets face it, he offers very little creativity going forward anyhow. By next season I suspect we will be without Tiote and Krul too. Although I think Tim would be mad to leave. We’ve done well bit we’re still not out of the brown stuff imo. The league again is very tight with 2 wins or losses having the potential to make a big difference on your placing. Until we’re in the top ten we’ll be looking over our shoulder. I agree with Jail. It’s far too early to start acting as if the last 2 years didn’t happen. They were beyond atrocious and there’s nothing to say this hot streak isn’t exactly like last seasons and we tail off with a bang. The test is WBA , on form we should be beating them but time and time again we’ve proved we can’t handle consistency and have crumbled against lesser sides. I’ll be more dissapointed to lose that one than I was happy to beat Liverpool. However I’ll be more happy as well as it will show we can turn up against the smaller teams. 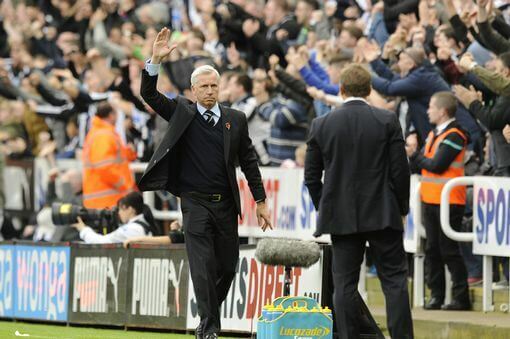 But I Pardew won 4 very difficul games.. Even when he was being hold at gun point from the board and the fans.. Great job Pards! Jail youve just made my morning! Slimy wearer of silly glasses. GatesheadMag @22 – To be fair last season’s home win over Chelsea and away win at Man U. were pretty memorable but I agree there have also been too many crushing defeats especially to the mackems. Reports that Obertan, maybe out for 5 months, that’s a blow for the team as he was starting to look the player he should be. 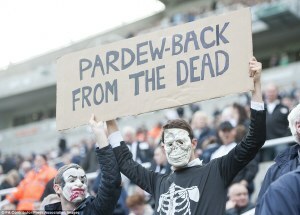 Gaol, did you forgive Pardew, when they pulled back 4 goals against Arsenal, in that classic 4-4 game? I guess the WBA game is where we will see how good we actually are – teams now know how we will be set up so will change accordingly. Tbf, West Ham won all 3 of their league games in October, but weren’t in the Cup. Pardew might get it for all the pressure and for turning it around against some decent teams. need to ensure we dont switch off at west brom. I don’t see the present performances as a turn around but more like a reset, as in it is the way we should have been playing from the start of the season. There are definitely some good moments of play, a work ethic throughout the team and substitutes that are able to effect the game. I hope by continuing to win the team are able to improve in the quality of their performances and attack with more intent, rather than consistently relying on quick counter attacks. Pardew has always had the most success playing off the back foot, inviting pressure and creating space in behind for our fast players to exploit. This has also led to a lot of high scoring defeats when the team has either been out played, or forced to play more adventurously. Committing players forwards has been the eternal problem for Pardew as it looses his much valued defensive shape. If there is to be a turn around it is needed in a more balanced style of play and this is where Pardew misses Cabaye. He realised far to late that the midfielder was not just able to hit accurate long passes over the top, but also carry the ball in to the oppositions half and provide goal scoring passes. Without any other player being able to step up to the mantle of Cabaye and the counter attacking style largely not working until recently, the team have had to find resolve from each other and with re-found pace has become successful again. With the up coming International break there is a huge potential that the self belief in the team will overflow and performances will again become fragmented. Lets hope that whilst improving in their ability to move forward with the ball the team do not expose themselves at the back, as is so often the case and should not be forgotten. Pardews nailed on certainty for October manager of the month. Newcastle United would join Arsenal in joint 3rd of Manager of the month awards, with 13. Only Manchester United 27 and Liverpool 14 have more awards in the Premier league. 70TWO @34 – Good analysis. When is manager of the month annonced? Forgive him for the 4-4, no comprehendo hombre ?